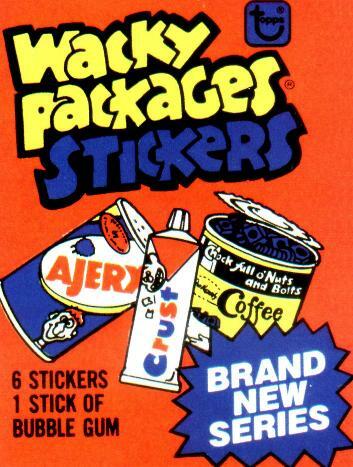 Most wacky collectors are familiar with the Wacky Packages Reprint Series of 1979 and 1980. There were four different 66 sticker sets which were reprints of the famous 1973-1976 Original Series, and the titles were numbered consecutively from #1 to #264. The only new title was Ice Krunkles, which was a Lost Wacky unused from the original 12th Series in 1975. A Wrapper proof showed up a few years ago, with production code 0-490-21-01-0. This would designate the wrapper to the Reprint Series, but nothing else was found. Then Topps shocked the Wacky World in June of 2004, when they auctioned off a paper checklist for a 1980 5th series which was never published. It was pasted on the back of a football card, and another identical checklist was auctioned a year later in June of 2005. This set only had 55 stickers, but the most interesting aspects are the titles. 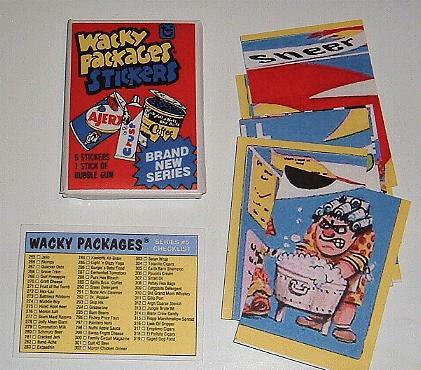 There are over a dozen Wackys from the Die-Cut & Original 1st Series on the list! Had this set actually been issued, many of today's rare wackys (Band-Ache, Jolly Mean Giant, Moron Salt) would not be so highly prized. 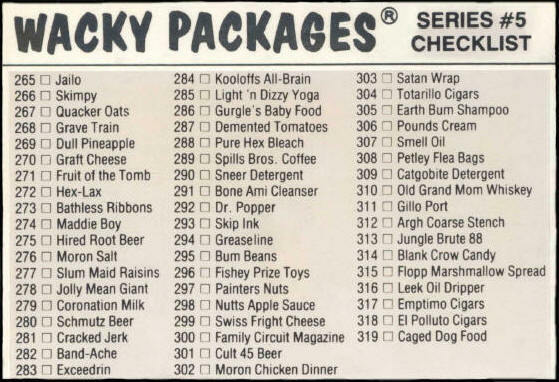 Oddly, the Checklist named Sticker #305 as Earth Bum, which had already been printed as Sticker #191 in the 3rd Series of this set. It is assumed that this was a typo (common with Wacky Packages), and the intended title was Earth Barn. In February 2005, we got to see the Series 5 puzzle. 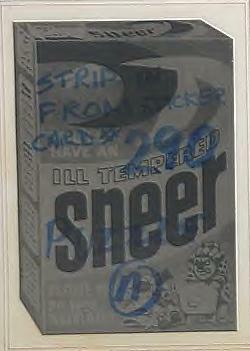 Topps auctioned a black and white prototype sheet of 3 uncut Sneer Puzzles. 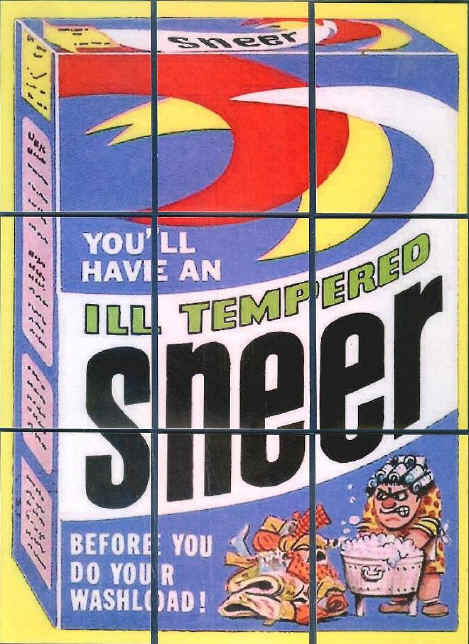 Back in 1980, this would have been the first wacky puzzle to feature a parody of a non-Topps product. Can reissues be considered Lost Wackys? So far it seems that nothing from this series ever made it to the final stage. But I just couldn't resist printing up a few wrappers and puzzles, with checklists on the back.